Forward is by Earl Mindell, R.PH., PH.D. Finally, a serious alternative health guide that tells you what really works including specific brand names, dosages and courses of treatment. For 200 health conditions listed alphabetically, Nature's Pharmacy compares conventional treatments to your best options form alternative health disciplines, including herbal medicine, nutritional therapy, homeopathy, and Chinese traditional medicine. You'll also learn how to stock and "alternative medicine cabinet" that meets your family's daily needs without the dangerous side-effects of many over-the-counter medications. 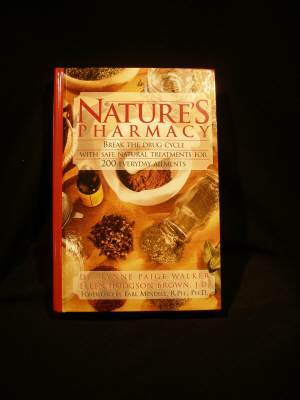 Co-authored by a licensed Doctor of Pharmacy with over 20 years of traditional and alternative pharmacy experience, Nature's Pharmacy is quite possibly the most authoritative guide to alternative health treatments available today.